FILE - A picture taken on Sept. 25, 2015 shows cars parked at the logistics park of German auto giant Volkswagen in Villers-Cotterets. Paris prosecutors have opened an investigation into suspected fraud by German carmaker Volkswagen. The move follows findings by United States investigators that the car company rigged vehicle pollution emissions tests. Volkswagen admitted last month that some 11 million of its diesel vehicles worldwide contained software that switched pollution controls on during emissions tests, but shut them off during normal driving. The cars spewed 40 percent more emissions into the air without the controls. The "irregularities" have damaged the company's reputation and threatens its business. The European Union urged its 28 member countries to start their own investigations into Volkswagen's fake emissions tests, with Germany's transport minister announcing that the automaker has admitted it falsified results in Europe, just as it did in the United States. Volkswagen chief executive Martin Winterkorn resigned, saying he is taking responsibility for the “irregularities” detected in the diesel engine tests, but was “not aware of any wrongdoing.” He was replaced by Matthias Mueller to help the automaker recover from the scandal. 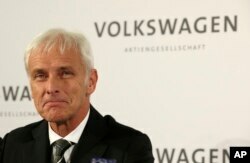 The 62-year-old Mueller, who has headed Volkswagen subsidiary Porsche, pledged to help the automaker get through the biggest business crisis in its 78-year history. Mueller said the company would introduce "even tougher compliance rules" and added that his goal is to make Volkswagen "an even stronger company." In the United States, several lawsuits have been filed against the automaker. U.S. environmental regulators say Volkswagen faces fines up to $18 billion. German Chancellor Angela Merkel has called the VW issue "difficult" and urged the company to explain its actions thoroughly.